The Pacific Sea Nettle is a large species of jellyfish with a bell averaging 30cm in diameter. This jellyfish has 4 long tentacles that surround the mouth and are known as "oral arms". Along the perimeter of the bell are 24 marginal tentacles that are organized in groups of three. 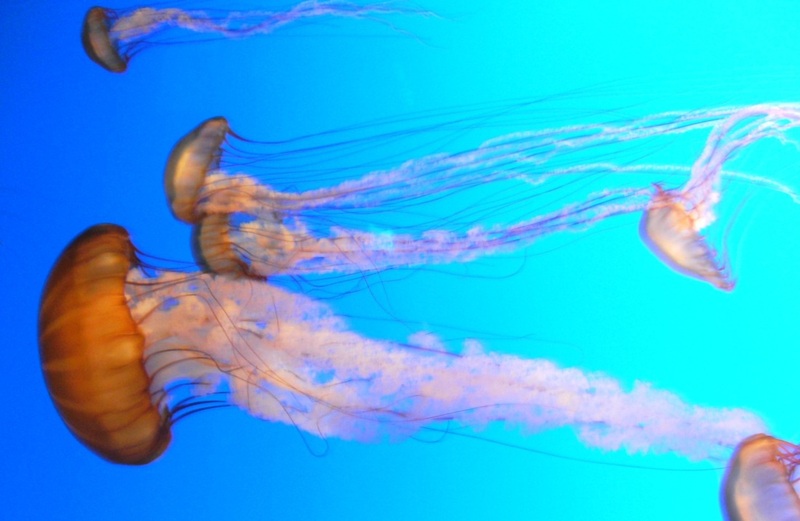 The Pacific Sea Nettle is light amber in coloration and is darkest near the margin. Movement is executed through the use squeezing the bell and pushing water behind it. They feed on zooplankton, crustaceans and occasional fish that become entrapped in their tentacles. Reproduction is sexual in the medusa stage and asexual in the polyp stage. The Pacific Sea Nettle is common off the coasts of Oregon and northern California in late summer, fall and winter. It is often seen in large aggregations just offshore. The majority of the time, they are found floating passively in the water column. Pacific Sea Nettles have been known to wash up on public beaches along the west coast of the United States. Although their stinging nematocyst cells are effective against humans who happen to brush against their tentacles, stings rarely require serious medical attention. "Chrysaora fuscenscens". Encyclopedia of Life. Retrieved from: http://eol.org/pages/203472/details.